Every Backstreet Boys fan has a first time … that first time they heard the boys or saw them on television. For some, it was TRL. For others, it was in Europe in the mid ’90s. Some fans became BSB Soldiers late in life, while others have been fans since they were toddlers. Everybody has their story. For Adrianna Lopez, her story started when she was just 5 years old. Lopez practically crosses the country from California to two stops in Texas before moving to Florida where she was introduced to the Backstreet Boys for the first time. In Lopez’s case, becoming a Backstreet Boys fan changed her life. Like many fans, she had tough times growing up the boys’ music was always there to help her. Meet November 2017’s Soldier of the Month – Texas’ Adrianna Lopez. I'm currently a nanny for 3 boys - 5, 4, and 1-years-old. My name is Adrianna Lopez. I'm 27-years-old. I was born in California but raised all over the world because I am an Air Force brat. I have moved 8 times (10 including house & apartment switches.) My favorite place to live was Hawaii. I love cruising and dream of going on the Backstreet Boys cruise one day. I have four nephews and two nieces that I love with all my heart. How long have you been a BSB fan? I have been a BSB fan since I was just 5-years-old so for 22 years I've loved and been dedicated to BSB. Once I heard my first BSB song I knew they were something special and I fell in love..
What is your favorite BSB memory? My favorite memory is meeting them for the first time and getting to share with them just how much they and their music truly means to me. What is your favorite BSB song and why? Oh this is so hard to choose! “What Makes You Different (Makes You Beautiful)” has a special place in my heart because it got me through some difficult times. I was able to share that with the boys recently. What is your favorite BSB video and why? “The One” is my favorite video because it highlights the fans and tour memories from the Into The Millennium tour. Every time I watch it I get nostalgic because that tour was the first time I ever saw the boys live and were also my first concert ever. Who is your favorite Backstreet Boy and why? Brian is my favorite and has been since the beginning. I love his fun and silly personality. I can always count on Brian to make me smile or brighten up my day. Whenever I feel down I can always watch a video of Brian being silly and it will make me feel better. He's a Christian like me so that also makes me love him. How has BSB impacted your life? 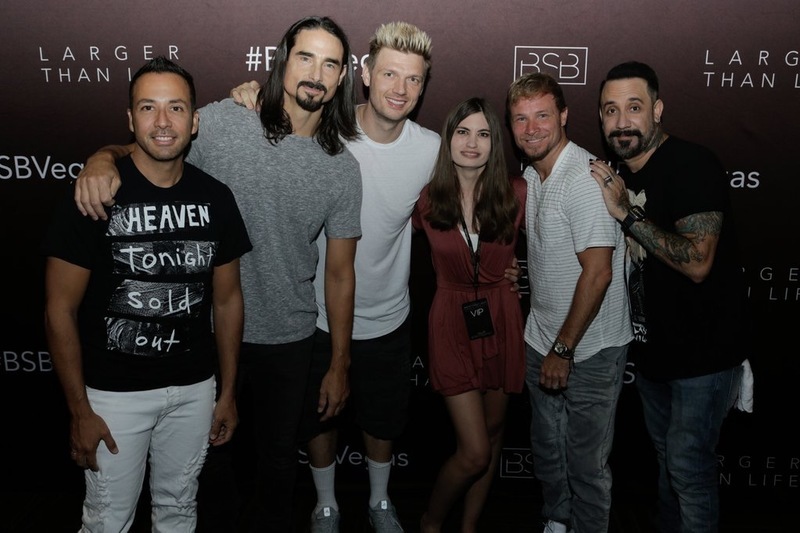 Backstreet Boys have impacted my life in an amazing way and I was lucky enough to be able to tell them that. On top of moving every 3 years growing up I was bullied a lot. I ended up having severe anxiety and depression. The Backstreet Boys music was the only constant thing in my life that I always had with me. When I felt sad I would just listen to the music to feel better. As I said What Makes You Different Makes You Beautiful had a special place in my heart. I would listen to that song and pretend they were singing to me. It reminded me that I am beautiful the way I am and that I don't have to be like anyone else. They helped me get through suicidal thoughts that I had. Today they still help me when I'm going through a tough time. Kevin whispered in my ear "Be safe and stay strong sweetie." I keep those words in my heart and always think about that moment when I'm having a rough patch. What is your favorite thing about being a BSB fan? My favorite thing about being a BSB fan is the love and appreciation they have for us. They make us feel special. I also love the love and friendship we have for each other as fans. I love that fans are always willing to help other fans out. Have you been to Vegas? If so, how many times and if not, are you planning on seeing a show? I have only been to Vegas once but I enjoyed every second of the show. I would love to go a second time but I'm not sure that will happen. I highly recommend every fan try to get to a Vegas show. It is worth every penny!